In recent years, oats have slowly but surely established their presence in Indian kitchens. Packed with protein and fiber and low on fat, oats are at the top of the list of healthy foods. Oats contribute to a healthier heart and also help regulate blood sugar. Oats are largely looked upon as a breakfast item. When mixed with fruit, nuts and low-fat milk or yoghurt, they provide a filling and nutritious start to the day. But, they are too versatile to be restricted to breakfast time and tastte as good in their savoury avatar as they do in the sweet form. In this delicious recipe from the south of India, oats replace rice to up the nutrient quotient of the dish. With all the flavours of the original recipe maintained, you can enjoy this delicious bowl of to your heart’s content, guilt-free. Dry roast the oats and keep aside. 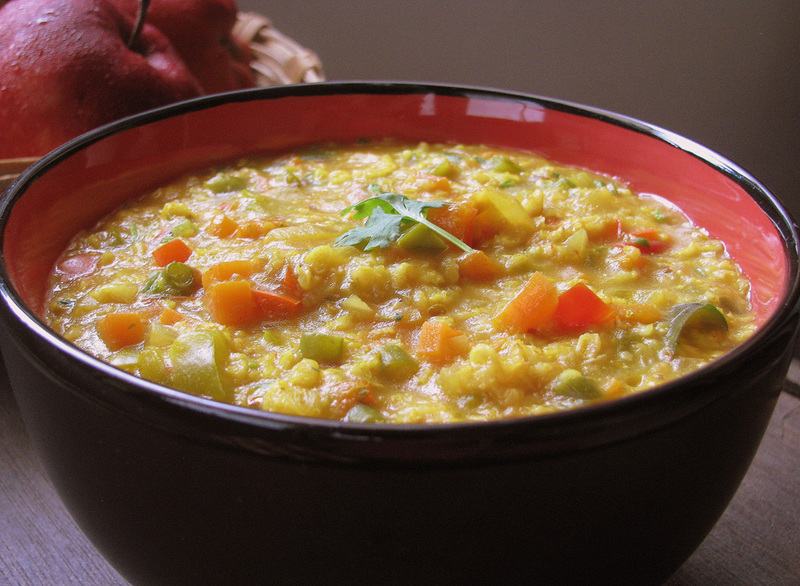 Cook the dal and the vegetables in a pressure cooker for 2-3 whistles and keep aside. Heat the ghee in a non-stick pan and add mustard seeds. Once they start spluttering, add the urad dal and saute till the dal turns golden brown. Then, add hing and curry leaves and saute for a few seconds. Add onion and garlic and saute till the onion turns transluscent. Add tomatoes and saute till they soften. Add the red chilli powder and saute for a few seconds, stirring continuously. Add the dal and vegetable mixture, oats, turmeric powder, bisibelle masala, tamarind juice and salt and mix well. Next, add water a little at a time till the oats are cooked. The bisibelle oats should have a khichdi-like consistency. Serve hot with low-fat curds. Dr Abhay Agrawal is a world-class expert in all types of Bariatric and Diabetes surgeries: Mini Gastric Bypass, Roux-en- y Gastric Bypass, Sleeve Gastrectomy and Ileal Transposition (Diabetes Surgery). He is highly skilled with vast experience in advanced laparoscopic surgery. One of the few in India to offer 3D laparoscopic Surgery. Dr Agrawal is among World’s first and few to be certified as International Surgeon of Excellence from the non-profit accreditation organisation from USA, Surgical Review Corporation (SRC). He has treated more than 4000 patients with Bariatric and Diabetes Surgeries. His Bariatric and Diabetes Surgery program is well known for consistent and high quality results in long term weight loss and permanent cure for Type 2 Diabetes. He personally treats every patient with out delegating it to juniors. Dr Agrawal is available for consultations and surgeries at his own Center for Obesity and Diabetes Control (CODC) Malad East; SevenHills Hospital Andheri East; Apollo Spectra Hospital Tardeo, at Mumbai; and once a month at Kalda Hospital Raipur, India.